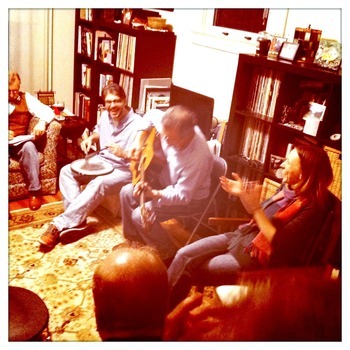 We hold monthly gatherings that include a song circle on the first Monday of every month. Sometimes we change the date to accommodate holidays; the specifics are posted on our calendar. They begin at 6:30 with dinner prep and music. We have our traditional pasta and salad dinner with the additions you bring at 7 pm. After dinner music continues until about 10:30 with our collaborative song circle that includes music makers and music lovers from the Tribes Hill community and newly invited guests. 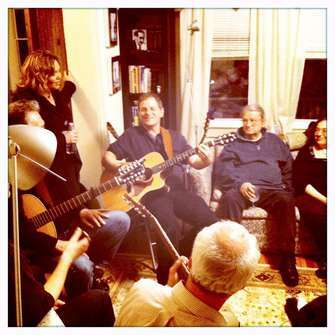 We respectfully fit into the space offered us with about 20 - 25 people and plenty of acoustic music and song to share. We even help cleanup! The Tribes Hill community thanks those who have been so gracious to host over the years. The volunteer who offers to host a gathering is someone who wants to fill their home with the joy of communal dinner, music and friendly people. If you would like to host a Tribes Hill gathering at your home, please check the calendar on this site for available dates, then email both the coordinators with one or more possible dates and your location. Once scheduled and confirmed, we'll post the announcement on the website calendar with your contact information, address/directions, end time, etc. Be sure the gathering is scheduled on your calendar as well! You will be reimbursed for the basic food expense through donations by the generous folks attending. In the potluck tradition, guests are asked to bring additional food and/or drink to complement the pasta dinner! Salad: 3 bunches of leafy green lettuce, mixed spring greens, etc (Organic preferred) Salad additions welcome! UNSURE, QUESTIONS? Put it on the side and label it!